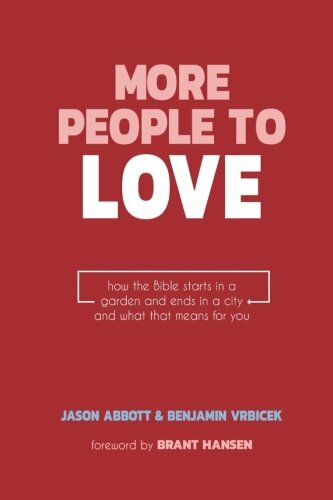 Just before Christmas our book More People to Love was released. If you didn’t get a chance to pick it up, you can get it for free by subscribing to this blog (see sidebar). And if you want a paper copy, the book is only $7.99 on Amazon. Below is the foreword to our book by author and syndicated radio host, Brant Hansen. A note before you start reading this book: Be careful with this stuff. If you take Jason and Benjamin seriously, you might wind up doing something dangerous, which is to say, actually follow through on it. You might even pick up and move. Now, for some people, moving into a troubled city is no big deal. But to me, it was an ironic twist of the highest order. At the University of Illinois most of my friends were from Chicago. I was from a town called “Assumption” (population: 1,000). We argued endlessly about the relative merits of urban versus rural lifestyles. Of course Heaven would be rural. It’s obvious. And Hell? Well, I’m just saying, it’s overcrowded. Probably has a subway. So draw your own conclusions. I even used to dislike (again, I’m not making this up) Sesame Street because it was too urban. It scared me. Trashcans and brick buildings and apartments and everybody packed in there. Sure, I liked Grover—who doesn’t?—but the city thing was freaky.
. . . and then it happened; I moved to the city. The ideas in this book, the ideas in the Bible . . . well, they’re dangerous, and they changed things for me. They changed everything. It’s taken a long time to absorb, but I’ve learned that, apparently, God loves people more than cornstalks. I’ve also learned God wants to conform my heart to his. Sometimes, this means re-thinking, which happens to be what “repentance” means. So, very long story short, here we are—my family and I living in the inner city. And, to add irony, on our street they could film Sesame Street. I frequently joke about hiding in our trashcan in front of our old brick building and doing some grouchy freelance puppetry. I still love small towns and yearn for the familiar, but God has changed my heart on this one. As Jason and Benjamin point out in this book, heaven is going to be a city. The old hymns steered me wrong on this one. Nature is beautiful, but is it possible that, to God, cities have a beauty of an even higher order? I’ve looked over the Rift Valley, and I’ve marveled at Yosemite and, like you, have seen the night sky. God also created us to create. He loves us. To think we can also make something beautiful because we’re stamped with his image, and put so many people, who are so loved, in one place—there’s something breathtaking about that, too. My wife and I have a totally different life together now. Our neighborhood is everything I was scared of growing up. We can’t set foot out the door without interacting with someone interesting, whether it’s a friendly old neighbor lady or a not-friendly old neighbor lady; a drunk person at 9 a.m. or the local drug dealer; the wonderful family crammed into an old place across the street with their five sweet little boys or . . . well . . . that young man who attacked my wife with a hammer in broad daylight on a Monday morning. Like I said, there’s always someone interesting just outside our door. And when that hammer was thrown at my wife, she was just walking the dogs. Thankfully, she wasn’t hurt. Still, the guy just came up the street and threw a hammer. Then he ran up to her, put her in a headlock, and eventually threw her on the street. This was everything we’d feared, whether we’d said it aloud or not. Could we even stay here? My wife now says in some ways it was a blessing. We’re more connected to our neighbors than ever, and they know who we are. They also got to see my wife’s desire to forgive her attacker, even as we let the justice system do its necessary thing. We pray for the guy. And we pray for our neighbors. Addicts, wiccans, weirdoes, whatever. Hey, we’re weird too, and we’re not here to change you. We can’t do that. We’re actually for you. Truth is, we don’t totally know what we’re doing. But wow, is this interesting! I don’t tell you this to tell you we’re awesome. I tell you this because we’re not. You can do this, too. I don’t know what I’m doing. I’m an introvert and socially awkward and very selfish and I don’t naturally like people at all . . . but my heart is changing. God loves people—needy, broken people—and now . . . well, here they are, right outside our window. I’m convinced he not only loves them, he likes them, too. Imagine that. Here’s to getting there together!